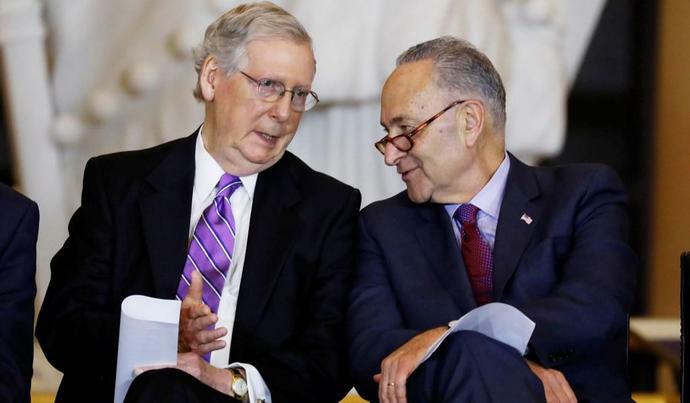 Under the deal, the Senate will vote Thursday on two bills intended to end the shutdown. One bill includes President Trump's request for $5.7 billion to construct a wall at the southern border, and one would fund the government entities affected by the shutdown through February 8, kicking the fight down the road until then. "People are saying isn't there a way out of this mess, isn't there a way to relieve the burden on the 800,000 federal workers not getting paid, isn't there a way to get government services open first and debate what we should do for border security later?" Schumer said in announcing the deal. "Well, now there's a way." Earlier Tuesday, Schumer panned the president's weekend proposal to end the shutdown, which included restrictions on the ability of immigrants to claim asylum. "It was not a good-faith proposal. It was not intended to end the shutdown," Schumer said on the Senate floor. "No one can call this new effort a compromise. The president's proposal is just wrapping paper on the same partisan package and hostage tactics." "Do Democrats really want to throw federal workers, and all Americans, under the bus - just to keep their political fight going with the president?" McConnell asked.